Throw your Fixodent® away! Want a permanent, hassle-free alternative to removable dentures that will keep you smiling and looking like yourself again for the rest of your life? Your missing teeth can be replaced easily with implant-supported dentures that will function and look like natural teeth. At The Silverstrom Group, you’ll have the option to retrofit your current dentures or have a new custom-made set permanently attached to your gums with titanium implants. As one of our patients, we will provide you with the care and support you need to maintain your implant dentures after you have received them. To learn more about the implant process at our Group, visit our Dental Implant page. For those who prefer traditional dentures, we can create a set of dentures that are customized to provide unparalleled comfort and control while creating a beautiful, natural-looking smile. Both first-time denture wearers and those looking to upgrade an existing set are welcome. Dr. David Silverstrom and Dr. Gary Silverstrom are particularly pleased to serve patients who have never had a set of dentures that fit satisfactorily, including those who have been told by other dentists that their cases were unusually complex. The differences between dentures that fit adequately and those that are custom-crafted to fit perfectly are profound. The dentures produced by our dental experts will allow you to chew, speak, laugh, and smile with the same confidence you had with your original teeth. You will never again have to feel self-conscious about your teeth in social and professional settings. Your quality of life will improve dramatically. At The Silverstrom Group, we will take great care to mold and craft the framework of your dentures so that it fits securely in your mouth, making slippage extremely unlikely. Using the latest digital and computer technology, we will determine your ideal bite and make sure that your dentures come as close to replicating the look and feel of natural teeth as possible. Depending on your budget, we can use either plastic or porcelain to create your prosthetic teeth. Although excellent results can be achieved with either material, porcelain is by far the most realistic option. It is stronger and more durable, and, like natural tooth enamel, allows light to pass through its surface rather than simply reflecting it. Hybrid Denture is the implant-supported prosthesis, it combines the advantages of a fixed replacement with those of a removable denture. It is a cross between a traditional denture and a fixed bridge. Hybrid dentures look and feel like real teeth, you can get back your teeth and smile in one day. 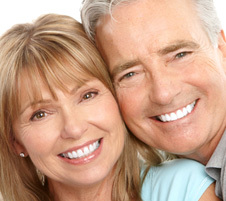 Looking for state-of-the-art denture treatment near you? Our dental spa is conveniently located in Livingston NJ and we service patients from surrounding towns of Northern and Central NJ as well as NY. To learn more about the different denture treatments including partial, hybrid, veneers, clear choice or implants please contact us for a consultation. We look forward to providing you with the most convenient and comfortable dental experience you have ever had.